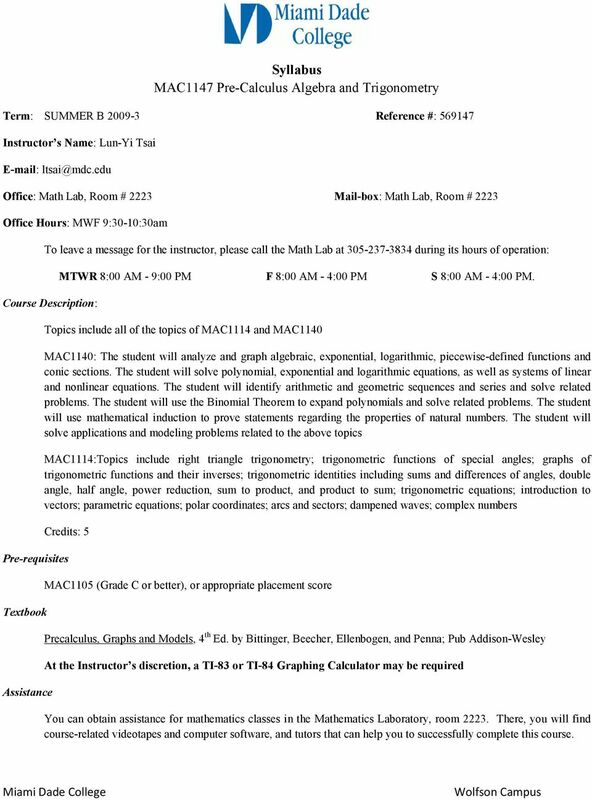 Download "Syllabus MAC1147 Pre-Calculus Algebra and Trigonometry"
1 Syllabus MAC1147 Pre-Calculus Algebra and Trigonometry Term: SUMMER B Reference #: Instructor s Name: Lun-Yi Tsai Office: Math Lab, Room # 2223 Mail-box: Math Lab, Room # 2223 Office Hours: MWF 9:30-10:30am To leave a message for the instructor, please call the Math Lab at during its hours of operation: Course Description: MTWR 8:00 AM - 9:00 PM F 8:00 AM - 4:00 PM S 8:00 AM - 4:00 PM. 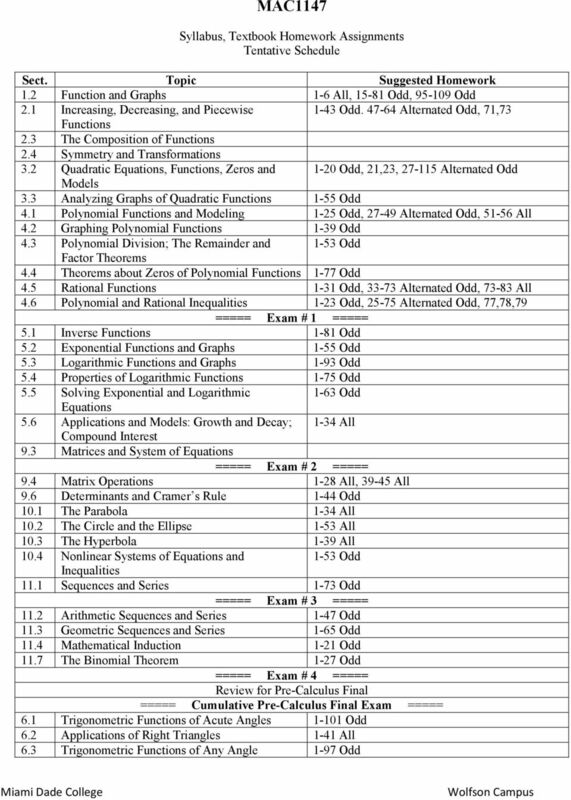 Topics include all of the topics of MAC1114 and MAC1140 MAC1140: The student will analyze and graph algebraic, exponential, logarithmic, piecewise-defined functions and conic sections. The student will solve polynomial, exponential and logarithmic equations, as well as systems of linear and nonlinear equations. The student will identify arithmetic and geometric sequences and series and solve related problems. The student will use the Binomial Theorem to expand polynomials and solve related problems. The student will use mathematical induction to prove statements regarding the properties of natural numbers. The student will solve applications and modeling problems related to the above topics MAC1114:Topics include right triangle trigonometry; trigonometric functions of special angles; graphs of trigonometric functions and their inverses; trigonometric identities including sums and differences of angles, double angle, half angle, power reduction, sum to product, and product to sum; trigonometric equations; introduction to vectors; parametric equations; polar coordinates; arcs and sectors; dampened waves; complex numbers Credits: 5 Pre-requisites Textbook Assistance MAC1105 (Grade C or better), or appropriate placement score Precalculus, Graphs and Models, 4 th Ed. by Bittinger, Beecher, Ellenbogen, and Penna; Pub Addison-Wesley At the Instructor s discretion, a TI-83 or TI-84 Graphing Calculator may be required You can obtain assistance for mathematics classes in the Mathematics Laboratory, room There, you will find course-related videotapes and computer software, and tutors that can help you to successfully complete this course. 2 The Math Lab is open during these hours: MTWR 8:00 AM - 9:00 PM F 8:00 AM - 4:00 PM S 8:00 AM-4:00 PM. You do not need an appointment to get assistance from the tutors on the Floor, but the tutors on the Floor must help all the students and may have to take turns; they cannot work with one student for a prolonged period of time. One-to-one tutoring (1 hour long session) is available by appointment only. 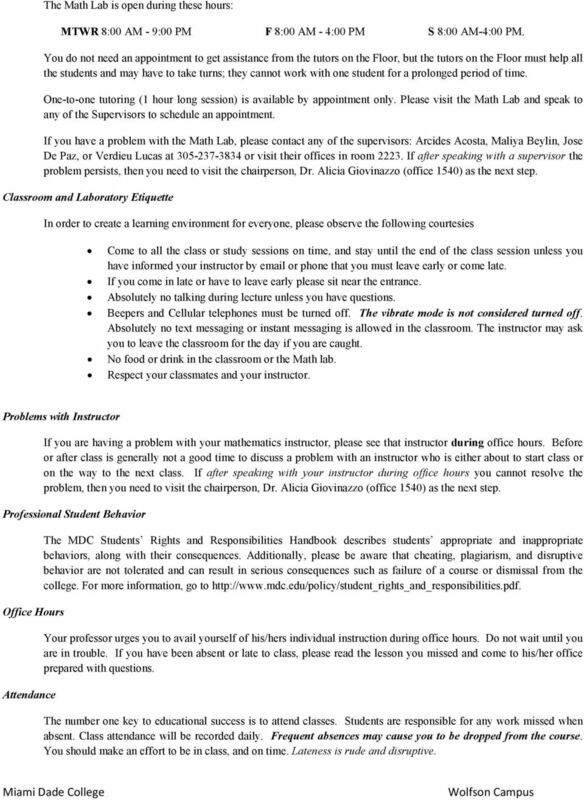 Please visit the Math Lab and speak to any of the Supervisors to schedule an appointment. If you have a problem with the Math Lab, please contact any of the supervisors: Arcides Acosta, Maliya Beylin, Jose De Paz, or Verdieu Lucas at or visit their offices in room If after speaking with a supervisor the problem persists, then you need to visit the chairperson, Dr. Alicia Giovinazzo (office 1540) as the next step. Classroom and Laboratory Etiquette In order to create a learning environment for everyone, please observe the following courtesies Come to all the class or study sessions on time, and stay until the end of the class session unless you have informed your instructor by or phone that you must leave early or come late. If you come in late or have to leave early please sit near the entrance. Absolutely no talking during lecture unless you have questions. Beepers and Cellular telephones must be turned off. The vibrate mode is not considered turned off. Absolutely no text messaging or instant messaging is allowed in the classroom. The instructor may ask you to leave the classroom for the day if you are caught. No food or drink in the classroom or the Math lab. Respect your classmates and your instructor. Problems with Instructor If you are having a problem with your mathematics instructor, please see that instructor during office hours. Before or after class is generally not a good time to discuss a problem with an instructor who is either about to start class or on the way to the next class. If after speaking with your instructor during office hours you cannot resolve the problem, then you need to visit the chairperson, Dr. Alicia Giovinazzo (office 1540) as the next step. Professional Student Behavior Office Hours Attendance The MDC Students Rights and Responsibilities Handbook describes students appropriate and inappropriate behaviors, along with their consequences. Additionally, please be aware that cheating, plagiarism, and disruptive behavior are not tolerated and can result in serious consequences such as failure of a course or dismissal from the college. For more information, go to Your professor urges you to avail yourself of his/hers individual instruction during office hours. Do not wait until you are in trouble. If you have been absent or late to class, please read the lesson you missed and come to his/her office prepared with questions. The number one key to educational success is to attend classes. Students are responsible for any work missed when absent. Class attendance will be recorded daily. Frequent absences may cause you to be dropped from the course. You should make an effort to be in class, and on time. Lateness is rude and disruptive. 3 Registration Withdrawal Homework Grading It is your responsibility to make sure that you are registered for this course. Be sure to obtain a copy of your schedule to verify the reference number and that you do not have any outstanding fees. You will not be allowed to take the final exam if you are not in your instructor s class roster so make sure to resolve any issues prior to the final exam date. If you feel that you will be unable to complete the requirements for passing this class, it is important that you drop the class by the college's "drop date" as established by the registrar's office. You should speak to your instructor prior to making the decision to drop. Remember that it is your responsibility to drop a class, not the instructor's. If extenuating circumstances such as illness, accident, change in employment situation, etc., prevent you from continuing to attend your class before the drop date, speak to your instructor first and if needed, to the Chairperson, Dr. Alicia Giovinazzo (office 1540) to assess your options. If such a situation occurs after the drop date, you should contact the instructor for information as to how you can complete the requirements for passing the course. At the discretion of the instructor, homework may be completed on line or on paper. Homework completed on paper is turned in to the instructor at the beginning of class on the day of each unit test and is generally checked for completion. All work must be shown. Your complete name and MDC-ID, instructor s name and reference number, book section numbers and problem numbers must be clearly written on your homework. Section numbers must be highlighted. The homework must be turned in stapled together and in the proper order. Homework may not be turned in late. 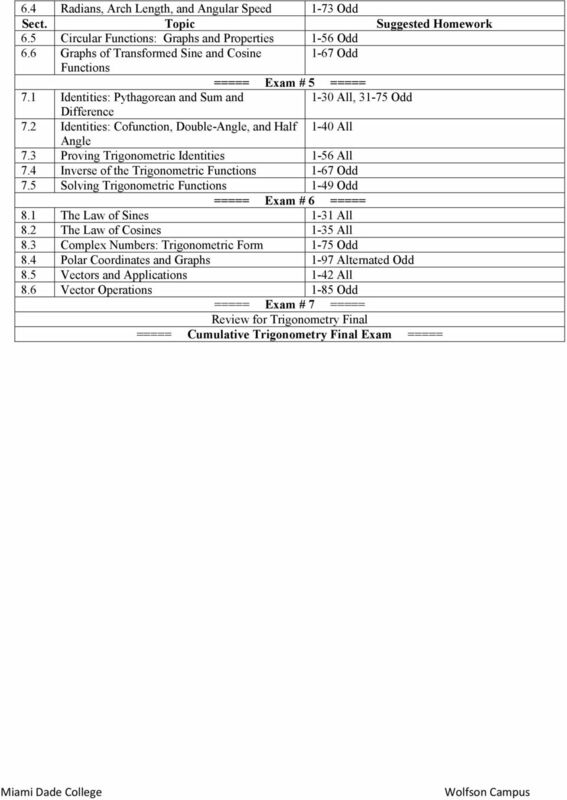 In this class, you will have 7 Unit Exams Short in-class quizzes, at the instructor s discretion Online quizzes, homework and reviews, at the instructor s discretion 2 Mandatory Final Exams (One for Pre-Calculus and the other for Trigonometry) which are cumulative. Grading scale: The final grade will be based on the following components Best 6 out of 7 Exams 60 % Homework and Quizzes 15 % Average of the 2 Final Exams 25 % Total 100% Average of % Average of 80-89% Average of 70-79% Average of 60-69% Average below 60% A B C D F Incomplete In addition, at the discretion of the instructor, students may be assessed through various in-class activities such as board work and small group presentations. 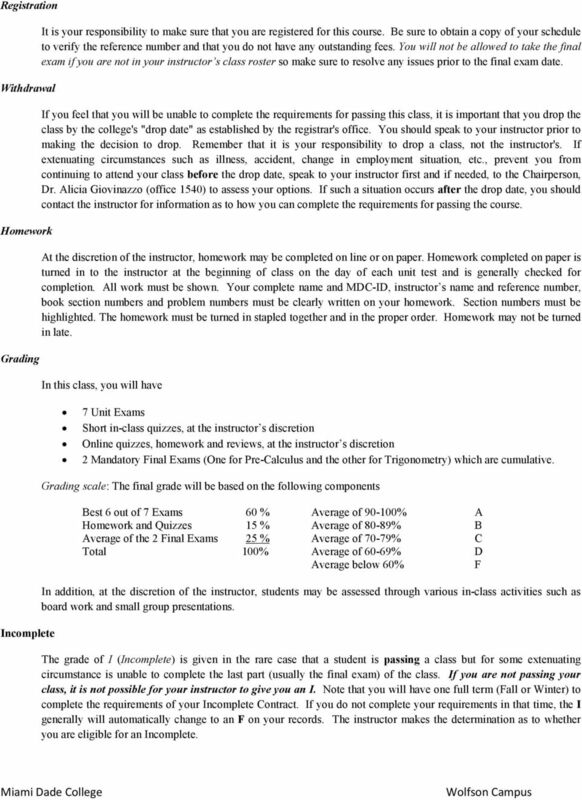 The grade of I (Incomplete) is given in the rare case that a student is passing a class but for some extenuating circumstance is unable to complete the last part (usually the final exam) of the class. If you are not passing your class, it is not possible for your instructor to give you an I. Note that you will have one full term (Fall or Winter) to complete the requirements of your Incomplete Contract. If you do not complete your requirements in that time, the I generally will automatically change to an F on your records. The instructor makes the determination as to whether you are eligible for an Incomplete. 4 MDC Account Important Dates Students are required to activate and use their MDC account. The MDC account allows students to receive from their instructors and get notification/announcements or other pertinent information from the College Class begins Weekdays and Evening M Jun 21 Last day to Withdraw with a Grade of W F Jul 16 Last day of Final Exams F Jul 30 Holidays Independence Day: S Jul 3. 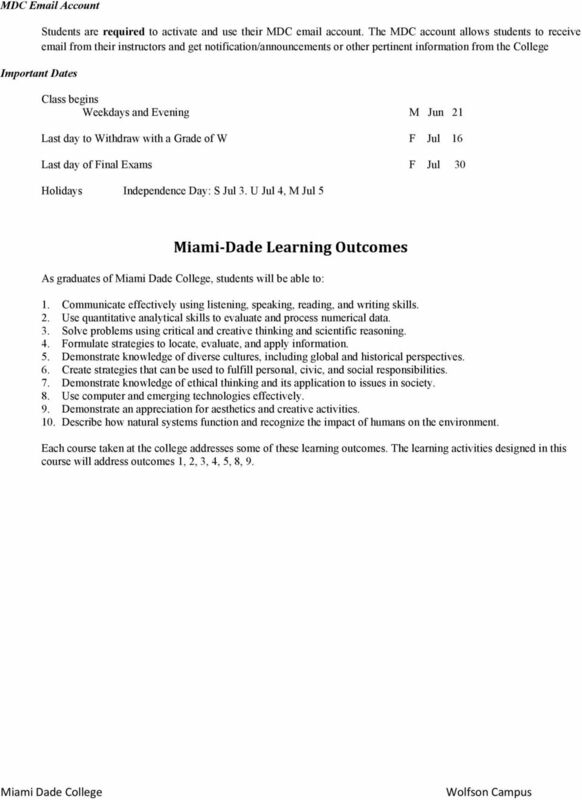 U Jul 4, M Jul 5 Miami-Dade Learning Outcomes As graduates of, students will be able to: 1. Communicate effectively using listening, speaking, reading, and writing skills. 2. Use quantitative analytical skills to evaluate and process numerical data. 3. Solve problems using critical and creative thinking and scientific reasoning. 4. Formulate strategies to locate, evaluate, and apply information. 5. Demonstrate knowledge of diverse cultures, including global and historical perspectives. 6. Create strategies that can be used to fulfill personal, civic, and social responsibilities. 7. Demonstrate knowledge of ethical thinking and its application to issues in society. 8. Use computer and emerging technologies effectively. 9. Demonstrate an appreciation for aesthetics and creative activities. 10. Describe how natural systems function and recognize the impact of humans on the environment. Each course taken at the college addresses some of these learning outcomes. The learning activities designed in this course will address outcomes 1, 2, 3, 4, 5, 8, 9.